If you want to impress, you can't go wrong with these chic 9ct white gold diamond earrings. With their fabulous illusion setting these diamond earrings appear much bigger than they actually are. The perfect finishing touch to her little black dress. 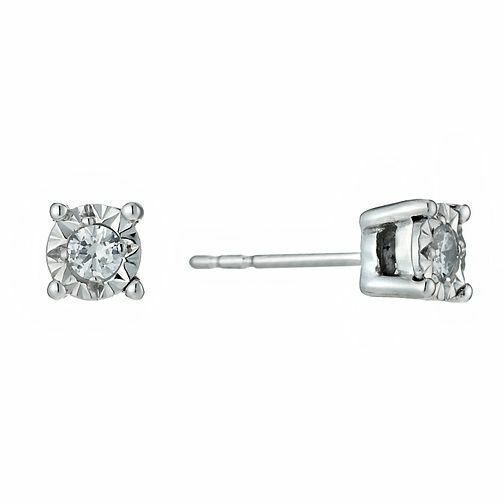 9ct White Gold Illusion 1/10 Carat Diamond Earrings is rated 5.0 out of 5 by 1. Rated 5 out of 5 by Anonymous from Lovely diamond earrings. I have received those lovely earrings from my partner. They are lovely diamond earrings. No too big just right for everyday use. That’s what I have been looking for. I love them!